Known for hunting the supernatural, no mortal man realizes Lord Cedric is one of Sorceress Morrighan’s abominations. After competing in a tournament, he is wed to a Lady of the Court, Angeline. Cedric’s senses begin to overwhelm him and he struggles to decipher his feelings. Are they a creation of his incubine bloodline or truly heartfelt emotions for the girl who has lost it all to him? He finds himself forced to choose between falling in love or continuing his suicidal quest to kill his creator. Epic battles against all manners of beasts and demons fill this story with memorable antagonists such as Morrighan and her two sisters; Romasanta the Father of Werewolves; Succubus Queen Lillith and many more. Find yourself engulfed in lores and history long forgotten from the 12th Century and beyond. Q: Welcome, Valerie. Thanks for joining us today. Can you tell us a little about yourself? A: Currently I am aiming to get a Bachelors of Science in Gaming & Simulation Programming since one of my long term dreams is to take creativity to a more interactive form of storytelling like in video games. I still have a long ways to go in order to be able to do this, but for now, I have turned my focus to Self-publishing novels. I am what they call a ‘Florida Cracker’ since I was born and raised in Winter Garden, Florida just outside of Orlando. In fact, I was 5th generation on the same road there and unfortunately, haven’t had many chances to venture outside of the State. A: The earliest moment that I recall taking writing to the next level was in the 5th grade. It may seem silly, but I actually have a composition book on my bookshelf that I filled with a handwritten story about a girl's plane crashing in Africa. It’s not so much of a Fantasy story like I love to write these days, but I can’t help but smile when I think about it or see it there on the shelf. It’s sort of a reminder that I wasn’t just drawing from the start, I was also writing. 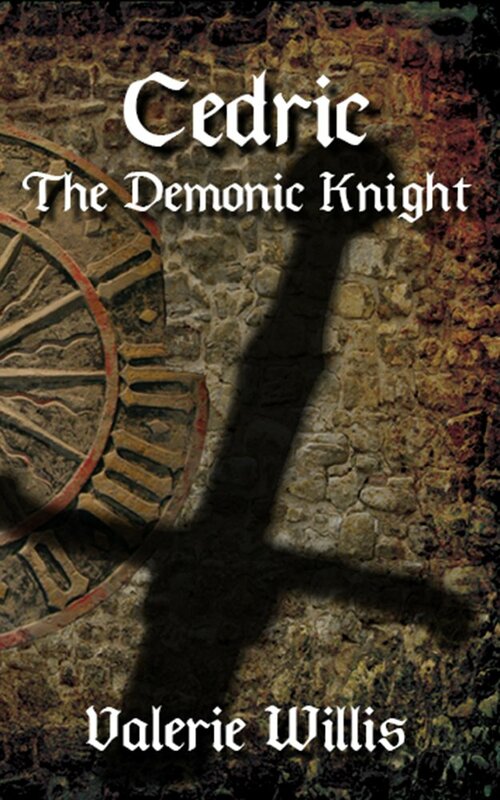 A: Recently I Self-published my first novel, a fantasy romance story, ‘Cedric the Demonic Knight’. This story takes place mainly in the Medieval Times where lores and history are blended to create the world around the characters. Known for hunting the supernatural, no mortal man realizes Lord Cedric is one of Sorceress Morrighan’s abominations. Cedric’s senses begin to overwhelm him and he struggles to decipher his feelings. Are they a creation of his incubine bloodline or truly heartfelt emotions for the girl who has lost it all to him? He finds himself forced to choose between falling in love or continuing his suicidal quest to kill his creator. Readers can expect a Bad Boy for a main character who is angry about the fact he might be falling in love. A: I found myself literally feeling depressed about all these Vampire shows and books. No one was revisiting the original lores and I felt we were leaving behind a legacy at the rate it was happening. Determined to show the world that they are forgetting the roots of these creatures they were falling in love with, I started digging. My aim was to gather forgotten legends and lores with the 12th century era in mind. I fell in love with a lot of the Romanian tales, which ironically held more than one version of several demons. Teaming these with the medieval bestiaries and the forgotten Russian Knight Hero Ilya Muromets, I began developing my own interpretation of reintroducing the lost lores. Q: Have you published any other books? A: Awww… I am not here yet! Cedric may feel like a one book bang, but I have plans to do books from this universe to cover the back story of several characters introduced as well as a more in-depth telling of Cedric’s origin story. Outside Cedric, I am also working on a Urban Fantasy Young Adult Trilogy and the first installment, ‘Tattooed Angels: Rebirth’ is to be expected no later than Fall this year! A: I honestly will have to say it’s one of the secondary characters, Romasanta. He is introduced in ‘Cedric the Demonic Knight’ as Romasanta the Father of Werewolves. There was a lot of research and development that went into this character that blended a lot of lores together with an actual person from history. Granted, even Cedric was developed in the same way, this one I had a lot more fun with. His name is from Manuel Blanco Romasanta, one of the first documented serial killers in history who confessed he was a werewolf. Ironically, he came from a family that had a very strong Romanian belief system, which ties him back into the lores I was pulling into the story. A: I cannot express the self-conflict I had in regards of the fact my main character is half incubus and that this will require the book to have several sexual scenes. As a reader, I have never been into Romance or erotica novels, but I have always liked when the fantasy writer would add sexual tension. My goal was to stay away from anything romancey or erotica, no writing about the “main event”, and keep it to only depicting the part that leads to the “main event”. This left me red faced several times, and you should have seen the panic when I got the call that my Mother-in-law read my book and liked it. Q: As an artist, do your sketches ever inspire your writing? A: It's hit and miss whether a concept or character comes at me via sketch or written format. Sometimes I get a visual of a character and start doodling him out and from there I conceptualize what sort of person this is and before i know it, a story is developed. Other times I am hit be a story and I spend hours writing it all down as it drowns me. If you came over to my home, you would find that for every story concept, I have notes, sketches and at minimum a few pages written down. Q: Are you currently working on any video games, and if so, do any of your ideas tie into your writing? A: No current game projects at the moment. I do have a few Game Design documents typed up. These are technical papers but they cover the story plot idea as well as the importance or type of interactivity that I want to tie into it. Though I have been fortunate enough to have my artwork or my story concepts involved in student game projects. A: My goal is to make my readers fall in love with my characters and to always take something with them when they finish reading it. It brings me great joy to hear the readers excitement about a character they’ve discovered in my story, and a lot of times it’s not even the main character! They usually follow that with something they liked a lot. For instance, someone told me that they absolutely like how no matter how hard Cedric fought himself in regards to falling in love with Angeline. “In the end, he really did love her though…” was what they added with a grin on their face. A: My current work is the cleaning and editing of ‘Tattooed Angels: Rebirth’. This is the first book in a planned trilogy that I started before even researching Cedric’s story. This one I started writing back in 2001 when I was in high school, so I am having to rewrite the beginning half of the manuscript. The premise is that high school senior Hotan discovers he is an reincarnation of an immortal. The immortal Geliah, the controller of the element of Fear, is after him for revenge for the events set in motion by his former self. The question is, will Hotan be able to unlock the secrets on how to use his own powers of the element Rebirth in time to save himself and those he loves? A: RESEARCH. Take your time and do the legwork to research the options, the writing/editing techniques, marketing, your genre, and anything else relevant. Join forums and groups, get advice and guidance from as many people and sources that you can find. Do not get discouraged and take everything as a challenge to improve yourself and your writing style! Reaching the nook just off the main street, she approached the blankets covered in merchandise. Jewelry, belts, and dresses filled them and the designs made her cousin’s collection look like it belonged to a street sweeper’s wife. Looking about she saw no one, but took a moment to squat, taking a closer look at the assortment of rings. The variety of jewels and precious stones amazed her as she picked up one particular ring with its eye-catching deep blue gem. It was teardrop shaped with small pearls on either side as the gold braid band made its loop around. I wonder if it would fit? Cedric was growing more and more annoyed as he went from one merchant and the next. Bouncing between what felt like a dozen or more people, all of them reluctant to answer his questions. Mentioning anything about lepers was shutting down any further information and he was running out of ways to ask. There were so many scents in the air in town making it impossible for him to smell Romasanta out. His nose and senses had been flooded the moment they came within visual range of the lepers and their diseased flesh. Now in the busy commotion of Cerdanya, the smells were thicker, besides the smell of spices and foreign cured leathers, there was the pungent burnt smell of wood and flesh from the recent fires to free a section of the town from the Black Plague. He doubled back and started on Angeline’s side. Looking around, he walked up the street but could not see her in the crowds of people. Huffing he knew she was fine. If she were in danger, he would have felt her signal, the same one she had managed to use when she ran into the chimeras. He approached the merchant that he had seen her first speak to before he got distracted with the reactions from the other merchants. His selection held a wide variety of weapons of Arabic design but he spoke in the local tongue, Kerretes. It was still awkward to Cedric’s ears and tongue to jump through languages in a blink of an eye. There was so much that his new abilities had to teach him and the knowing without experiencing firsthand was hard to comprehend. It was like trusting something he could not see nor confirm that it really existed, but just needed to let it perform in the open for reassurance. His ears honed in on the private conversation as he stood there. “Yes, that’s the one!” They watched in confusion as Cedric took off down the street. Shoving through the crowd, angry shouts echoed behind him from the sudden intrusion. Deeper down the street he went as he looked for signs of Angeline. Nothing was giving him a clue as to where she had gone. The inability to sense where she physically was became a startling realization on his part. Their bond was limited and without the other one sending out some sort of emotional wave or a stab of pain or pleasure, it was like searching for a coin in the vast darkness. Grabbing up different men, they all pointed to the same back corner when asked if they saw a ranger pass through. Propelling himself free of the crowd, he stumbled into the abandoned nook. The only thing he had to go by was the narrow alley leading into the abandoned part of the town, which had two fresh sets of footprints. Sweat crawled down his temple and cheek as he launched himself into another run. His nerves were overriding his senses and if he could calm down, he would have a chance to hear her beating heart or at least over the sound of his own thudding against his chest. This was the worse place for him to be with his new abilities. Entering Romasanta’s territory, it was a rash move to begin with. Surely, his scent was all over her and with each stride, he felt more foolish for not taking the time to think this hunt for Romasanta through. Between his blood healing and the dagger, Angeline would have smelled identical to him. Cursing between pants, he could feel his incubine blood raging to be set free, making promises that the other blood knew it was incapable of achieving alone. This new awareness of his powers and demonic sides was like choosing between alternate versions of himself, yet they were still the same mind and heart. I’m a fool! I should have kept her by my side! I know better than this. Why did I let myself fall in love again? Losing Yvette destroyed me, but Angeline. If I lost her—She’s fine, she has to be. Wherever she is, she is not in pain and even if harm came to her, I can go as far as to take that from her no matter how far away he takes her. Damn it! Where are you! great interview and sounds like an awesome story!